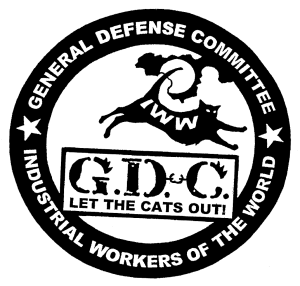 The Twin Cities IWW General Defense Committee (GDC) wishes to make known a recent incident of state harassment directed at our organization and allied groups, and our work against police murder and brutality in Minnesota. We encourage our friends, families, co-workers, and all those struggling against injustice to be alert to the possibility of FBI harassment and intimidation. We want those that had hoped we would be scared or slowed down to know that we are just getting started. On Friday, April 1st, 2016 a Chicago member of the Industrial Workers of the World (IWW – the Union with which the General Defense Committee is allied) flew up to the Twin Cities to help care for a friend and fellow union member recovering from major cancer surgery. Upon arriving at MSP she was asked by TSA to step into a room. She states that initially she assumed it had to do with her taking an extra bag on the low cost carrier that charges for additional baggage. Two men dressed business casual and without any papers or files came into the room. They identified themselves only as “working with TSA” and attempted to interrogate her. The one who led the questioning was a white man, heavy set and over 6′ tall with brown eyes, a receding hairline, and a Minnesota accent. The second agent, who stood over watching, was a Latino man with a bald head, muscular, maybe 5’9″ tall. Both men appeared to be in their forties. After responding to their first question, “Why are you here?”, our Union sister refused to answer any of their questions. The agents asked about her travel plans and local contacts. They asked about the 4th Precinct protests. They asked her about any membership/association with the IWW General Defense Committee and the IWW African Peoples Caucus – both organizations had been very active in the Justice for Jamar Clark movement and related struggles against police murder and brutality. They asked about two specific members of the GDC (one Black, one white). When they asked about her partner and kids by name, she told them to call her lawyer. They declined and told her she could go. Our Union Sister reports that she felt the whole interaction was centered on their concern about the Justice for Jamar Clark movement. All of the information, names, groups, etc. that the men listed to try and get more information or to worry us over how much they knew – are actually easily obtainable from monitoring open social media. Federal harassment of the labor movement and social movements for justice is nothing new – every time major movements emerge that challenge the power structure and the status quo, government intimidation and repression follow. The movement in the Twin Cities that came out into the streets in response to the Minneapolis Police’s murder of Jamar Clark has been determined and fierce. From the occupation and militant protests outside the 4th Precinct in North Minneapolis to the student walkouts across Minneapolis high schools to the shutdown actions of interstates, at the Mall of America, and MSP airport to the “Freeman Friday” protests at the Hennepin County Government – we have been proud to be a part of this mass, multifaceted movement. There is every reason to believe that the powers that be are not pleased to see the emergence of this movement for Justice for Jamar Clark (and Marcus Golden, Phil Quinn, Fong Lee, and Michael Kirvelay, too). The movement has been met with mace, chalk-bullets, and mass arrests at many of the protests, so it should not surprise us that the state is paying attention and will attempt to intimidate us as well. We should remind ourselves, our organizations and communities, of the importance of not cooperating with police or the Feds attempting to get information. They are not on our side, they are not trying to help, even if their questions at first seem innocuous – DON’T TALK TO THE FBI, DON’T TALK TO THE COPS. Do not let them in your home. If you are questioned by the police or the Feds, refuse to answer, ask if you are being held (and if not, leave), demand a lawyer – but whatever you say – SAY NOTHING. If you ARE visited by the police, make certain you tell others, so that everyone knows they’re creeping around. Finally – we say it is not time to cower or hide but to push ahead, building a militant, radical anti-racist movement based in the working-class and communities of color – a democratic movement controlled by the grassroots that can challenge police impunity and brutality, organize community self-defense and working-class power, and begin to build a new, just society.